Tired of seeing nothing but clutter all around you? Constantly losing your keys? Running out of closets to stuff full of things? Don’t wait for an annual spring cleaning purge–learn how to organize your home easily today and, better yet, keep it that way. You’ll be amazed at the difference it makes in your sense of well-being. The 7 books below are bursting with ideas to completely transform your living space into an oasis. 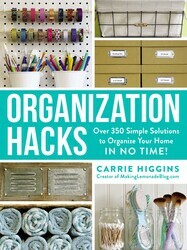 Discover project ideas and DIY solutions in ORGANIZATION HACKS by Carrie Higgins. 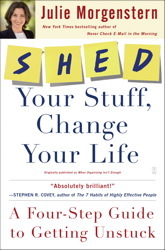 Find out how to purge clutter for good in SHED YOUR STUFF, CHANGE YOUR LIFE by Julie Morgenstern. 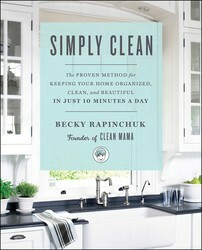 Get a step-by-step schedule for tidying up in only 10 minutes per day in SIMPLY CLEAN by Becky Rapinchuk. 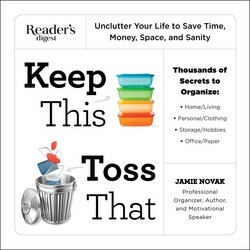 Learn how to decide what to keep and what to toss in KEEP THIS, TOSS THAT by Jamie Novak. See how invigorating it can be to embrace minimalism and clear out unnecessary belongings at any stage in life in THE GENTLE ART OF SWEDISH DEATH CLEANING by Margareta Magnusson. 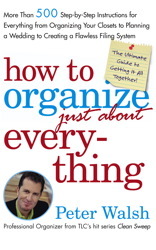 Pick up more than 500 easy-to-follow how-to instructions on how to make your life run more smoothly in HOW TO ORGANIZE (JUST ABOUT) EVERYTHING by Peter Walsh. 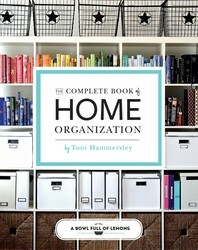 And see how you can organize every nook and cranny of the 30 main spaces of your home in THE COMPLETE BOOK OF HOME ORGANIZATION by Toni Hammersley. Fix your cluttered cabinets, overflowing drawers, and messy living areas with these tips, tricks, and project ideas from Carrie Higgins, the organization expert of the Making Lemonade blog. Carrie Higgins has made it her mission to share fresh ideas for the home on her blog Making Lemonade. In this guide she has collected her best quick fixes, innovative hacks, and DIY solutions to keep your home looking beautiful. Have you ever wished you had the time and tools to organize your house in a clutter-free, design-conscious, Pinterest-worthy way? From storage solutions and cleaning tips to secret space-saving methods and expert strategies, The Complete Book of Home Organization is packed with the tips and shortcuts you need. 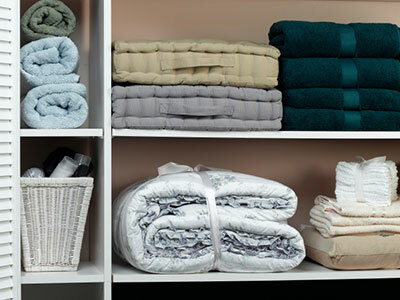 Organize the 30 main spaces of your home, including the living and dining spaces, bedrooms and bathrooms, guest areas, baby and kids’ rooms, utility spaces and garages, entryways and offices, patios and decks, closets and pet areas! Keep track of your pantry, holiday and craft supplies, weekly menu planning, keepsakes, and schedules. From the basement to the attic, this book covers every nook and cranny. With step-by-step instructions, detailed illustrations, and handy checklists, say goodbye to a messy home and wasted storage space! Expert organizer and New York Times bestselling author Julie Morgenstern teaches you how to get rid of the physical, mental, and time clutter that’s keeping you from the life you want. Julie created the SHED process—a four-step plan to get rid of the physical, mental, and schedule clutter that holds back so many of us. But SHEDing isn’t just about throwing things away! Julie teaches that its just as important to focus on what comes before and after you heave the clutter, so that the changes you make really stick in the long term. From the cleaning and homekeeping expert and creator of the wildly popular Clean Mama blog comes a simple and accessible cleaning guide with a proven step-by-step schedule for tidying a home in just ten minutes a day. Becky Rapinchuk, the “Clean Mama,” understands that many people don’t have enough time, organizational skills, or homemaking habits to have a constantly clean and decluttered living space. In Simply Clean, she can help you effortlessly maintain a tidy house and build habits to become a “clean person”—no matter how messy you may naturally be! Are you afraid to open your kitchen cabinet because you know food storage containers are going to come pouring out like an erupting volcano? Do you spend hours searching for the email you need? Will you regret it tomorrow if you give away all your old concert T-shirts? And how many tote bags will you really use? Keep This, Toss That answers all of these questions and much more. Featuring dozens of illustrated Keep/Toss Checklists, the book shows you exactly what you need—and what you can safely toss, regret-free (even if you’re a sentimentalist or saver)—in every room of your house, for each hobby or activity, and even online. 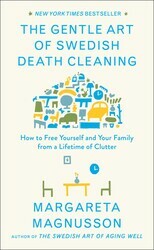 A charming, practical, and unsentimental approach to putting a home in order while reflecting on the tiny joys that make up a long life.In Sweden there is a kind of decluttering called döstädning, dö meaning “death” and städning meaning “cleaning.” This surprising and invigorating process of clearing out unnecessary belongings can be undertaken at any age or life stage but should be done sooner than later, before others have to do it for you. In The Gentle Art of Swedish Death Cleaning, artist Margareta Magnusson, with Scandinavian humor and wisdom, instructs readers to embrace minimalism.